Kickbike Cruise Max 20 Reviewed. Comfy all-day cruiser. The Kickbike Cruise Max 20 is a special Kickbike model designed for easy all day cruising at a comfortable speed. It is not a racing scooter, although it can keep up with one, and can even sail past one when the road gets a bit bumpy. The combination of the very lightweight aluminum Max frame, and the impact and vibration absorbing balloon tires, and the high, swept back handlebars, make the Cruise Max 20 the non-machine version of a beach cruiser bicycle. It is designed so the rider can stand up straight and look ahead down the bike path without having to tilt the head back from a prone stance. Most Kickbikes have their handlebars lower down and further forward, placing the rider in a position that makes you want to go very fast all the time. The Cruise Max 20 is meant for another type of scooting. 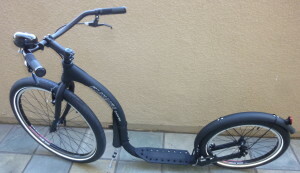 A nice, upright, long, comfortable, ride around town, or along your local scenic bikeways. Rather than the 400 meter sprint, this is for the half-marathon. When your carton arrives and you pick it up, you might think they left the wheels out, or the frame out, because it weighs much less than you think it should. As thick and hefty and large as the Cruise Max 20 looks, the aluminum frame and all the components seem light as a feather. The Cruise Max 20 arrives mostly assembled and almost anyone can finish the job without resorting to a bike-shop visit, but no manual is included. If you have no idea about anything to do with bicycles, or if you cannot get your fingers to turn and hold little bolts etc, then just go to a bike shop, but insist on half-price assembly because all of the complicated bicycle drivetrain stuff does not exist on a scooter. 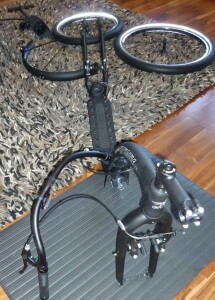 I set mine up using the upper dropout for the rear wheel which makes the deck ride lower to the ground. If you are tall and plan to ride on the trail, you could start with the higher setting using the optional lower dropout, but then you will have to work harder as you dip from that height when riding on the street. I often flip my brakes on scooters, preferring my right lever to work the front, but these cable lengths were so precise, and I would have needed another two or three inches for the back cable, so I just left it the American way around. So after unwrapping everything, I started with the handlebars, (the brake cables were already attached), then the rear fender and wheel, then the front wheel and lastly the big ding-dong bell. Then I had to adjust the V-brake systems quite a lot to get perfection, and that took me quite a long time. Note that these beautiful Schwalbe tires have a unidirectional tread so always make sure to mount them so they will be rotating in the right direction. On my Cruise Max 20, the tires also carry the reflectors, a nice reflective whitewall hoop, so this eliminates the need for those yellow plastic things that hook around the spokes. Safety first! It is always prudent to perform a quick pre-ride check on any scooter or bicycle. Tighten stuff, adjust things, inflate tires, check brakes etc. Your Kickbike may quickly get up to a terrifyingly high speed on a downhill, so be aware of this and be ready to brake before you get to any speed you are uncomfortable with. Don’t be embarrassed to wear the essential safety helmet. Make sure your shoe laces stay out of the way of the back wheel etc. If you are one the world’s rare and lucky people who have ridden a Kickbike or another brand of foot bike before, there are some marked differences about riding the Cruise Max 20 compared to the more racy models. Firstly, you are standing up straight, not leaning forward into more distant bars. The wide swept back bars mean that your arms help stabilize any side to side wobbliness, but keep their pivot point well forward over the front axle. Indeed the first kick keeps you moving with maximum stability for a surprisingly long time. This is one of the few scooters that can be steered with the fingers of one hand and remain steady at very low speed. While the identical stiff, aluminum, “Max” frame can be found in sportier models, it has different riding characteristics when matched to these Schwalbe Big Apple tires and these cruiser-style handlebars. This particular Kickbike model is best enjoyed at less than your maximum athletic speed. Stand up and enjoy the scenery and you will get a very long smooth ride with surprisingly little effort. Ideally you should only kick when the previous kick’s momentum has almost run out. Relax and cruise all day. The Kickbike’s wheel bearings are the modern cartridge type that evolved from skates. These are much better than the traditional cup and cone bearings that I had, for example, on my Mibo. Spin a wheel and it just keeps going and going for several minutes on end. And this, paired with the extremely light weight of the Aluminum Max frame mean that your first kick on level ground takes you a remarkably long distance down the path. It is amazing. This is the easiest push I have experienced since I owned a Kickbike Millennium Racer from 2003 to 2008. My first test ride from home base was just a quick cruise around a block or two or three. I made no attempt to go very fast, but just stood there and kicked when necessary. The descriptive terms that came to mind were lightweight, stable, and substantial. Yes, there is room for two feet on the deck. I wear US size 9.5W and I wore boat shoes. Note that most sneakers these days make your footprint a few inches longer and wider so wear soccer-style sneaks or boat shoes and enjoy all the extra room that this affords. Despite there being a piece of sandy grip tape down the center of the deck, it was easy to swivel and switch feet. Within the first five minutes, a stranger had waved me down to ask questions about this scooter. As usually happens, I was asked how it goes. People expect to be told there is a motor. The momentum seems to come from nowhere on this scooter. Of course, as with any unmotorized scooter, it will be better to step off and walk and push up any very steep inclines, but on the flat it just goes and goes and takes a very long time to noticeably slow down. I am predicting that conversation will be the main factor in slowing this Kickbike down and I should really prepare myself with a stack of Kickbike business cards. This is a nation where rocket-powered drag bikes may possibly outnumber humble foot bikes, unless you live in Amish country. 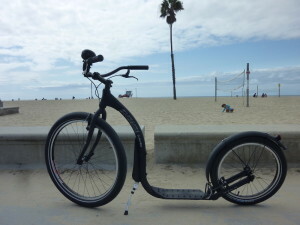 For my first longer ride, I popped off the quick release front wheel, and drove the Kickbike in the car to the beach bike path through Marina del Rey, Venice, Ocean Park and Santa Monica, California. This is an area I have scooted, cycled and skated along for two decades, so it provides the perfect test run for a review. The Cruise Max 20 was screaming for me to take it to Huntington Beach, where seemingly every single bike is a beach cruiser, but that is over an hour away on the freeways, so I resisted. The beach bike path is a mixed-use highway that hosts all kinds of bicycles, skateboards, skates and other devices. So riding any scooter along here gives you a good feel for how fast you can go with how much effort etc. I have tested many different scooters here. As with most scooters, my Kickbike was passed by much faster road bicycles, but I also found myself passing many slower bicycles, and this was despite a conscious plan to not go full speed. In fact I rode at a pace that kept the heart rate steady and conserved my energy. It was a very comfortable and silent ride. I rode without gloves, correctly reasoning in advance that I would not be leaning down onto my grips as I would with a racing Kickbike that had lower bars located further forward. Yes, this is a very subjective description devoid of speed and distance statistics, and that is deliberate, because everyone who does this will see their own different results. I can say that it was an extremely comfortable ride that did not exhaust me at all. It was about four times my walking speed, about a quarter of my walking effort and without the tired feet, and unlike a bike ride, pain-free. The fat tires took away all vibration and there was no shaking or rattling of the scooter, or the rider’s bones or the rider’s brain. I have to say that the experience will vary according to rider height. I measured my grips as being forty inches, or a meter, above the ground. For tall ladies and gentlemen, this might be a bit too low to get the same upright cruising experience, and taller riders may have to take the extra custom step of getting a higher stem fitted. Luckily for me, the meter high bars were perfect for my 5’ 7” height (170 cm). The deck felt much larger than the one I had on my old Kickbike Millennium Racer, although I do remember I always wore running shoes back then and those silly things make your footprint 20% bigger. This deck measures 38 cm X 11cm and I was riding with both feet aboard and switching feet without ever having to think about it or look down. I did notice that I was tending to place the heel of my boat shoe right at the back of the deck, which is the lowest point. I felt that the 8 cm deck height was low enough to make the kicks nice and easy. Again a tall person with much larger feet may not have the same experience here especially if they wear those bigger types of shoes. Also today I did take a couple of speed runs and a little mild downhill bombing. To get into an aerodynamic crouch on the Cruise Max 20, you just need to pull your elbows back a lot more. Going uphill felt quite easy. The same gradients that had me stepping off and walking my Mibo Gepard last year, were taken on board the Kickbike without much strain. I have to say that even my folding Dahon bicycle in lowest gear is harder to get up a hill than this aluminum scooter. 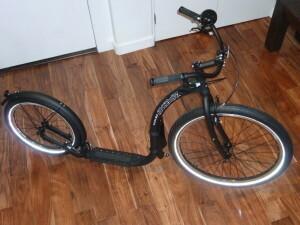 I did not have the luxury today of comparing this Kickbike side-by-side against another type of Kickbike, and so with the rarity of any physical stores, you will have to carefully consider which model of Kickbike is for you, and buy before you try. I suspect that most riders might prefer a more sporty model, and all models were introduced in my article of last week. but nothing can compare to the Cruise Max 20 for….. cruising. Kickbikes are designed in Finland and are available online in many countries. Here in the USA look on kickbikeamerica.com and on amazon.com. For more concise specs see the French site kickbike.fr. Jeffrey the Barak is the publisher of the-vu and at time of writing has had at least 16 kick-scooters and three electrics. PreviousPrevious post: Why does my Cappuccino keep changing? I sympathize with you about the Vbrake adjustment. Sooo much fussier than caliper brakes; more parameters to have to deal with. I had to replace brake cables after they got trashed from so many re-adjustments. Woe be unto you if your wheel rims are just a shade out of true, or the wheel isn’t seated into the dropout just so. The shoes have to be set to within 5mm of the braking surface to for decent braking power, so there’s very little “wiggle room” to allow for wheel wobbles. They’re a menace until you get them set up. Scooter envy . . .